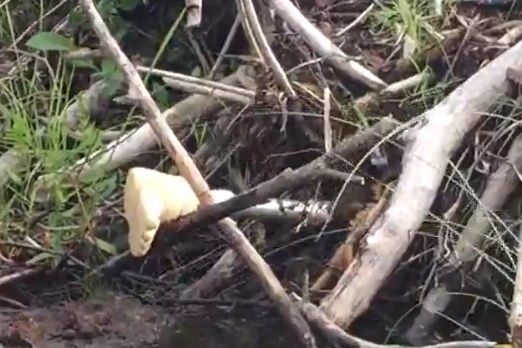 WABENO, Wis. -- A Wisconsin man has his prosthetic leg back after the lost limb was discovered sticking out of a beaver dam by two canoers. Elliot Fuller and Jason Franklin spotted the leg while paddling between a pair of lakes near Wabeno in Forest County on Thursday, the Wisconsin Journal Sentinel reported. Fuller said they were convinced it was part of a corpse until they got close enough to pull it out. A quick search on Craigslist yielded an ad from Mark Warner, who lost the prosthetic limb. "My buddy thought to look online and sure enough, someone in Wabeno had lost a leg," Fuller told CBS affiliate WFRV. The 49-year-old man from Green Bay said his own canoe tipped over during a July fishing trip on Range Line Lake in Wabeno. He rescued his fishing gear and cooler, but the prosthetic limb got away. "I wasn't overly worried about it because I use my older model for fishing and hunting," Warner said. "It wasn't my everyday leg, to put it that way." Fuller and Franklin found the limb three miles from where Warner lost it. They returned it to Warner on Friday, netting a $50 reward for its safe return. "Just did what I thought was right," Franklin said. "I hope that if I lost my leg that someone would return it to me, too." Warner said he was sure it was gone. A friend had to convince him to put up the Craigslist ad. "I really didn't expect to see it again. On my end, it's pretty amazing and it's pretty bizarre where it ended up," Warner said.